Your choice of speaker makes amplifier decisions for you. The other half of your decision making process will be dictated by the size of your listening room. Having a medium-efficiency speaker in a small room can open the audiophile to many different amplifier possibilities. In expensive urban environments like Hong Kong, London, New York, Paris, Tokyo, etc…, the audiophile is presented challenges, but also possibilities. Those expensive city apartments are too small for a dedicated listening room, which means smaller speakers, closer listening positions, and the flexibility to experiment with lower-power amps. The small listening area opens up choices that I’ve never had. I’ve lived my 36 years in Texas, where rents for most apartments are under $1k per month and over 1,000 ft2 in size. Most houses are at least 1,400 ft2, with an additional 2-car garage. Even during the real estate bubbles, space has been cheap in most of Texas, including the big cities. Granted, there are “exclusive” areas that command a relative premium compared to surrounding areas. The bottom line is that most of America, geographically speaking, will have the option for a spacious “music room” or “media room”. I’ve always had the use of a large living room for listening, from childhood to today. As a young boy, my parents had a house where the 400 ft2 garage was converted into a living room. The centerpiece of that room was a large TV, a Quadraphonic Marantz 4300 receiver, Garrard Zero 100 and four JBL Century L100 speakers. In hindsight, it sounded pretty bad, but at least I had a decent stereo to listen to Disney records (Donald Duck sounds cool in surround). It may come as no surprise that I’ve always had relatively powerful amps and inefficient speakers. I was so brainwashed by the mid-fi power wars that I assumed that you had to have 100 watts, minimum, to sound good. Thankfully, audiophile friends introduced me to tubes, and their ability to “punch above their weight”. Still, the lowest-power amp I used on a regular basis was 35 watts. It’s something that would’ve remained status quo until the MaxxHorn Luminations made their appearance. With efficiency approaching 100db/watt and no “classic horn sound”, the MaxxHorn Lumination is a speaker that pushes you to experiment. Every tube change, every cable change, VTA, etc, is audible. My first amps in for audition were the Art Audio Carissa, and a 1.5-watt SE-OTL. Both were good, but the Carissa seemed a tad bit coarse, unlike the PX25 which was super smooth, and the 1.5-watt SE-OTL was amazingly transparent with wonderful bass textures, but had no kick/slam/macrodynamics. The MaxxHorns would be intriguing with something more powerful than the 1.5-watt SE-OTL and more transparency than the Carissa. Luckily, knowing that I had a world-class horn with a world-class driver, Constantine arranged for the review of the Audion Silver Night 300B MK 3. I’ve heard most all amplifier topologies, with triodes, tetrodes and pentodes, from one-watt to 750 watts, but never the much highly vaunted, His Most High Honored Lord of tubes, King of the triode, the rightly revered and venerated 300B. The MK. III version of the Silver Night 300B substitutes a 6N1P for the 5687. There are also parts upgrades, though I did not ask what exactly was changed. The basic specifications remain the same. Two aspects in the specifications are worth noting. A distortion figure of .5% may seem high, but it’s an honest .5%, not some awful sounding .05%, artificially achieved through gobs of feedback. A circuit that can’t work without feedback could be considered a bad circuit. I’m not sure if the transformer is changed from the MKII version, but the frequency response should be at least as good as the impressive 10Hz-35KHz (-3dB). That would indicate a well made single-ended transformer. Hopefully I won’t hurt anyone’s feelings, but the tubes sent with the Silver Night don’t do the amplifier justice. After warming up the amp, there were occasional odd distortions coming from the amp—kind of like a firecracker. It was one of the input tubes. When the amp wasn’t making the crackling noise, its tonal balance was pushed forward, even more so as I cranked up the volume. There was a coarse quality to the upper midrange through the lower treble. In single-ended, zero feedback amps, quality of tubes and parts are more critical than in push-pull designs with feedback. Fortunately for me, Bob Spence of MaxxHorn loaned me three alternate sets of 300b. They were the top-of-the-line Chinese tubes, including the TJ mesh plate, and the EH Gold grid. All were clearly, like night and day, better with this amp than the JJ. Given that I used the amp with two different speakers and heard the same thing both times, I would say that it was a tube thing, and not some speaker issue. This was very easy, taking only a few hours to listen to the tubes and find a combination that worked. I swapped out the Sovtek 6N1P-eb for one made in the ‘70s with the rocket label and swapped the 6N23-eb for a gold pin US JAN 7308. If you hear this amp with the stock tubes, you really aren’t’ hearing what it can do. The output tubes are more critical than the 9-pin minis. The difference between my NOS stash of 6dj8 variants and the stock 6n23-eb wasn’t as great as the differences between the four makes of 300B. If I only had a NOS set of WE 300B from 65 years ago…. By the way, before someone says that the JJ’s were broken because the tube bases were loose, then I’d have to disqualify the other tubes too, since all of them, save for the EH, were loose. There’s something disconcerting about a power tube that can move around its axis while playing music. Somehow I don’t think that’s in the Western Electric specifications for the 300b. I could tell the loose bases made those 300Bs more microphonic, and that might be why I settled on the EH 300B Gold. It’s an all-round good performer, well made, decently priced and has a warmer/richer character than the others, making it sound subjectively more powerful. I had the opportunity to listen to several competing amps while reviewing the big MaxxHorn Lumination. The amp that had the closest performance to the Audion was the Art Audio PX25. However, the lushness and romanticism of the PX25, in conjunction with the golden tone of the Feastrex driver, was a little too romantic on some recordings (it reminded me of listening while drinking scotch). The PX25 was a great match with the PHL driver in the MaxxHorn Immersion, which has a hint of upper midrange brightness. After switching to the Silver Night, the highs of the Feastrex were more extended while retaining the beautiful midrange. Though the amps were rated within a watt of each other, the Silver Night had more headroom than the PX25. It’s possible that the transformer in the Audion more closely matched the 16-ohm load of the Feastrex. The Silver Night is a detail retrieval machine which benefits almost every aspect of performance, from dynamics to dimensionality. All recordings I listened to had a layer of haze removed. Whether from the simple circuit, or point-to-point wiring, or high quality parts, or all triode tubes, the Silver Night might be the most transparent amp I’ve used. The Silver Night has dimensionality in spades. On ELP’s Lucky Man, the Moog sounds were in a totally different space from the other tracks. At the end of the cut, the eerie spaciness evaporated into a space somewhere near where the back wall and ceiling met, but several feet beyond. How can four tubes and two drivers do that? We, Bob Spence and I, looked at each other with eyes wide. The Silver Night, combined with a coherent speaker, can pull out spatial cues and ambience as well as any other amp I’ve heard, making formerly tepid sounding recordings interesting. There was a new sense of life imbued into mono recordings, many of which seemed pallid and lifeless played on the big system. Perhaps only the simplest of amps and speakers can decode the simplest of recordings. The Audion can definitely make a mono recording sound big and lifelike. Spinning the 45RPM reissues from Chad at Acoustic Sounds and Music Matters presented a master class in dimensionality. These reissues are as close to a master tape as I’ve heard. On Mulligan Meets Monk (Analogue Productions AJAZ1106), Mulligan’s horn is monstrously huge, just like how a real life baritone sax should sound. The bari sax is a forceful instrument, and the Silver Night reproduced the size and scale. Mulligan was always in his own space, never wondering with volume and frequency. The overtones were wonderfully complex, making Mulligan sound as if he were in your room or you had a live microphone feed. Also, the sound of the recording studio was perfectly reproduced. You could hear the reflections in the room. You could tell the Audion very cleanly reproduced the subtle phase relationships that are necessary for a convincing image. The match between the Silver Night and the MaxxHorn Lumination had superb tonal balance and high frequency extension. The bandwidth was well above average for a single-ended amp. Up to the point of clipping, which was quite loud, the Audion never seemed to thin out, compress, get harsh, or shift tonal balance. I’ve grown accustomed to that behavior with most “traditional” amps; traditional in that they were using feedback. The more amps I listen to, the more obvious it is that global loop feedback will never work as promised. It’s impossible to undo something that has already occurred by feeding the error back into the amp a split second late. In reality, unless the feedback correction happens at the same time as the distortion, there can be no cancelling-out of distortion. The only possible limitation that I may have detected with frequency balance was a lack of heft below 30Hz. I say “heft”, as in the force, not as in “it wasn’t there”. It made upright basses sound a little more rosiny (is rosiny a word?) than the actual instrument. It’s not something I noticed until I was looking for something to nit-pick. The Audion is not bass shy. It has plenty of power for a horn system. It’s a matter of midbass to lowbass power balance. I was often shocked at how well the Audion Silver Night filled my large listening space without stress. I would say that the power rating is conservative. There is a balance when winding single-ended transformers. If you wind a transformer for better low bass performance, you often give up detail and high frequency extension. While there were amps that had more forceful bass, more slam, and more headroom with the Lumination, they all gave up transparency in trade. In comparison to the Mac 240, the bass wasn’t as meaty, but the Audion beat the venerable classic in just about every other performance criteria. Honestly speaking, the Silver Night was better in the bass than most other single-ended amps I’ve heard. Since the intended audience for the Silver Night isn’t noted for head-banging while listening to organ recordings, and that most users will be using efficient horn speakers, I would have to conclude that the bass performance is competitive with similar amplifiers in the class and more than adequate for the intended buyer; if you are reading this review, that means you. Keeping in mind what I’ve said about feedback, another strong area for the Audion Silver Night is rhythm. There’s nothing to slow the Audion down: no feedback, phase splitters or complex circuits. While the relatively low power could limit macrodynamics on some recordings, the microdynamics and timing were first rate. Drum kits had realistic snap and bite. Bass lines were propulsive, and never sluggish. The Silver Night makes for a lot of toe-tapping. The aforementioned dimensionality combined with the excellent rhythm made for wonderful interplay between bass, drums and piano. I need to caution buyers on another possible issue besides tube selection. I believe the Silver Night needs excellent isolation when used with horn speakers. The combination of the Audions’s great rhythm and the MaxxHorn’s tractrix cabinet produced amazing wallop that besides rattling things sitting on shelves and hung on walls, caused some microphonic issues with the amp. It showed up as an occasional brightness and gave itself away by ringing after stopping the CD player. Tapping on the amp, I couldn’t tell if it was the 6dj8 (notorious for ringing) or the 300B (a big bottle and lots of filament and grid wire to vibrate). I did notice that the Chinese mesh plate tubes were less microphonic than the EH and JJ tubes. After repositioning the amp, employing a tube damper for the 6DJ8 and setting on sorbothane isolation feet (preferred over points and cups), the amp was pretty much cured of any problems with microphonics. The criticism of tube choice and isolation is not much of a critique. Phono preamps are much pickier about tubes, turntables are pickier about isolation and horn speakers are pickier about where you place them. These issues are easy to overcome. Is there anything which limits the Silver Night? Yes, there is. It doesn’t put out unlimited power. I would love to have an amp as transparent, dimensional and fast to drive power hungry speakers. But, getting back to where I started, if you live in a small apartment, or have a small listening room, the Silver Night might make a wonderful amp for a moderately efficient bookshelf speaker or slim transmission line. I know one guy who uses a 300B amp with LS3a speakers and he loves the combination. It’s too bad that I didn’t have the Silver Night when I was auditioning the efficient Gemme Audio Tanto, which might’ve been a remarkable combination. Auditioning the Audion Silver Night with the Feastrex-equipped MaxxHorn was a revelation. I continued to hear things I’d never heard in recording after recording. If you have horns, or are dissatisfied with more powerful single-ended amps you’ve auditioned, I urge you to try the Silver Night. Its combination of virtues is first-rate and its shortcomings are few. Very highly recommended! First I would like to thank Phillip Holmes and Dagogo for the fantastic review. I fell in love with the 300B single-ended amp the first time I heard one. The rest has been history for me, RayofSound/ Lombardi Sales has been importing and selling SE amps in the US since the 1996.There are many 300B SE amp designs, most of them sound wonderful. But, they tend to sound slow and a beat behind as the tempo picks up. This is not the case with the Audion SE design as Phillip so gracefully mentions in his review. 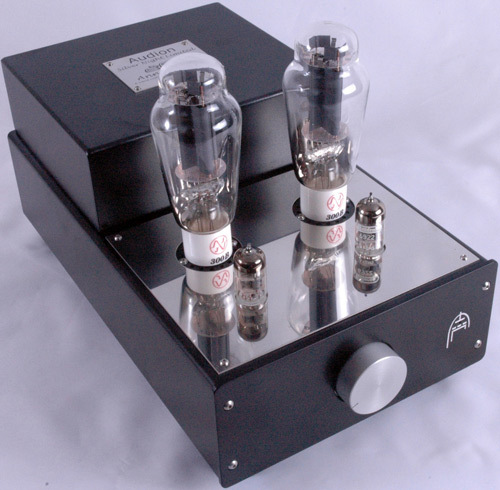 Audion has been designing and manufacturing 300B SE amps since 1986. Audion had the first major review of a 300B amp in 1992. Sam Tellig put Audion on the map with his review of the Audion 300B Silver Night 300B push pull mono, a longtime Stereophile class A recommend product. Since that time Audion has expanded its product range. We now offer SE amplifier designs in EL34, KT88, 2A3’s, PX25’s, 300B’s and 845’s. All of these amps are offered in stereo configurations as well as mono designs. All Audion SE amplifiers are lighting fast with world-class transparency due to their advanced transformer designs. I want to finish by thanking Constantine Soo. He has put his heart and soul into building a first rate E-magazine with some of the finest audio reviews available anywhere! Audion and Rayofsound wish Constantine and Dagogo continued success.